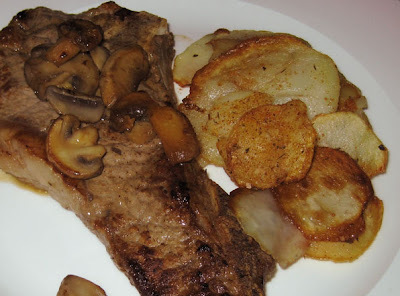 They were fried up in butter with some mushrooms and served with sliced potatoes cooked in duck fat. Yes, I said duck fat - we had about a cup of it leftover from Christmas dinner. OMG yum. Especially when the potatoes are dusted with a little Cajun seasoning (a.k.a homemade Emeril's Essence). The steak itself, although lean, tasted well enough. 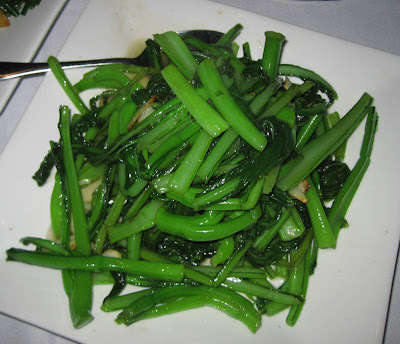 It satisfied the urge to chew, but was gristle-free, unlike the NY strips we had at Ruth's Chris earlier in the year. I also whipped up a little "steak sauce" with a bit of black bbq sauce and Worcestershire. We prefaced this meaty meal with bowls of parsnip velouté. Not really velouté because there was no flour in it, but I just like saying the word. 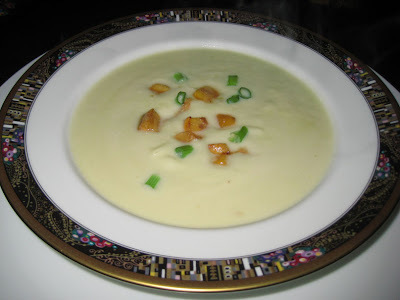 Velouté. Parsnips are my new favorite root vegetable and I want to put them in everything. 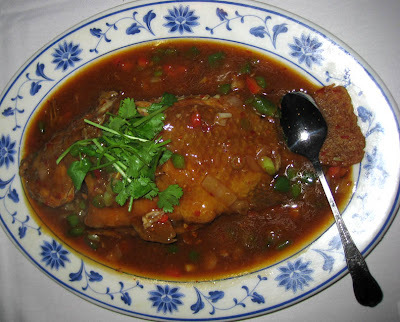 Including velouté. The recipe? I peeled three huge parsnips and cut them into chunks, placed the chunks in a pot with about 3 cups of water and one Knorr chicken bouillon cube and cooked them until tender. After it cooled, I pureed the lot of it in a blender, adding about a cup of milk (we had 1%) to assist in the blending. The puree went back into the pot with a scant cup of light cream, another cup of water, and another half bouillon cube. (If you have chicken stock on hand, by all means, use it! I had none.) Add more or less water and cream depending on the consistency you want to achieve. Taste for seasoning and add salt if needed (mine needed no further seasoning). 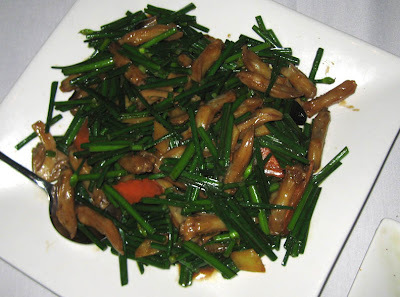 I just so happened to have some diced, sauteed parsnip from a Petit Louis doggie bag, so that became my garnish, along with a few bits of scallion. Later in the week, I'll garnish the leftover soup with some bacon. When I made Coconut & Lime's Cranberry Ginger Tea Bread, I thought the recipe needed something. I was originally going to try again and add more oil and maybe another egg and be done with it, but as the original loaf sat around, the more I thought it tasted like a fruitcake base. So that's what it became. 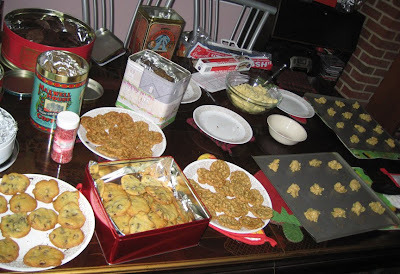 Dad was over on cookie-baking day, lamenting the fact that he had not yet had any fruitcake. He's not a connoisseur--he'll eat the super-commercial Claxton or Hostess brands with no complaint--but I thought he should have a good fruitcake this year. A home-made one, even. You legion of fruitcake fans out there are probably thinking "Wait up there, Miss Minx! 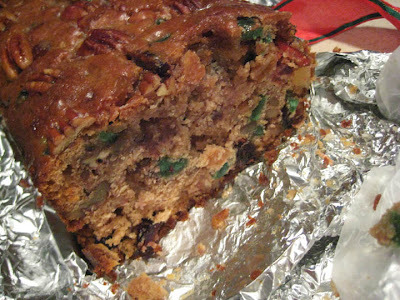 Fruitcake must be made weeks, even months, before its eaten! 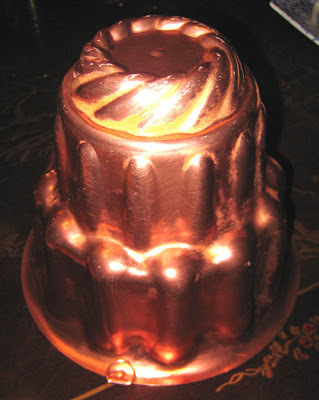 It needs to be wrapped in cheesecloth and doused in spirits (so consumers won't notice how bad it really is)." Yeah yeah, I tried that once. It was a lot of work and expense and the cake came out moldy because the fridge I stored it in had humidity issues. Never again. And that's why a quickbread version sounded particularly attractive to me. I changed the original recipe by swapping out the 1/4 cup of oil for 1/2 cup of butter. I didn't have sour cream on hand so used yogurt instead. And I omitted the fresh ginger. 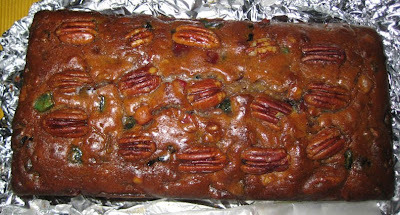 The fruit component of the "fruitcake" was made up of 3/4 cup of mixed dried blueberries, raspberries, and cranberries that I soaked in warm vanilla rum, about a cup and a half of chopped walnuts and pecan halves, and a good handful of that weird plastic-y fruitcake fruit (because I know Dad likes it). All of the extra ingredients required an extra half hour in the oven, but look at how golden brown and delicious it came out! I made sure the cake wasn't stuck in the pan before I brushed on a vanilla rum syrup (simple syrup with rum added). After unmolding the bread, I brushed the syrup on all sides and let it cool completely before wrapping it in foil. I presented it to Dad on Boxing Day. He wasted no time in getting a knife. Shockingly, amazingly - it was good. I hate fruitcake, and I thought this was pretty great. It wasn't too sweet, and there wasn't too much of the green cherry stuff. 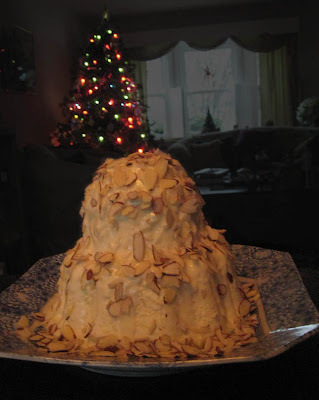 I think I might make this an annual tradition, switching up the recipe a bit every year. I realized as I was eating it that candied citrus peel is an integral part of the fruitcake flavor, as are nuts. The other candied bits are for texture and color. So next year I'll skip the red and green stuff. I think figs would make a good addition, maybe some dried sour cherries too. Any other suggestions? Does anyone out there actually like fruitcake? Some people make turkey for Christmas, but not me. If I never see turkey again, I'd be very happy! This holiday, my bird of choice was duck. Meet Donald. 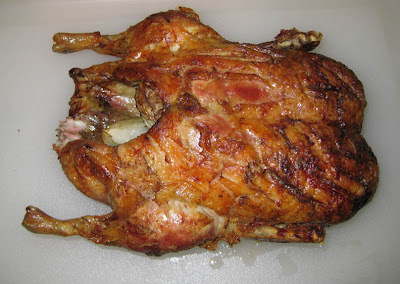 I roasted him for 4 hours at 300°F and an additional hour at 350°F, after slashing through the skin all over. Most of the fat rendered out (and was greedily saved by me for cooking potatoes in the future) which resulted in crisp skin. 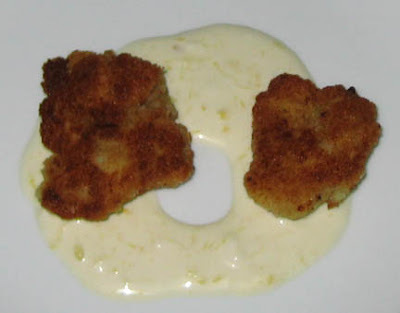 While he was a-roasting, I prepared an appetizer of chicken-fried sweetbreads with lemon mayo. Man, sweetbreads are a pain-in-the-tuckus to make. First they have to be soaked for a couple hours, then poached. Membrane-removal is next, followed by several hours of pressing. After all of that, I cut them into small pieces, dipped each one in seasoned flour, then beaten egg, then seasoned breadcrumbs, and shallow-fried them in canola oil. The lemon mayo was a simple concoction of 2 T mayo, the juice and grated rind of one half lemon, and a pinch of salt. Overall, it was pretty good, although I feel I could have poached the sweetbreads just a tad longer. The texture I achieved wasn't quite as firm as the sweetbreads we ate at Volt. The duck was a much easier preparation. I wanted to make a riff on Thai Luong's Basil Duck, so I mixed up a chunky sauce of sautéed onion, fresh basil, garlic, and a couple of tablespoons of Thai chile basil sauce. 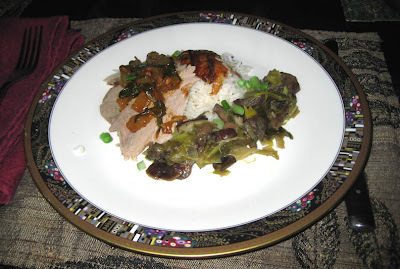 The sides were a leek and mushroom fondue (leeks, fresh shiitake, dried chanterelle, and white mushrooms cooked in butter and olive oil until the leeks "melt" and the mushrooms are tender), and Jasmine rice. Everything turned out deliciously, and I impressed even myself. 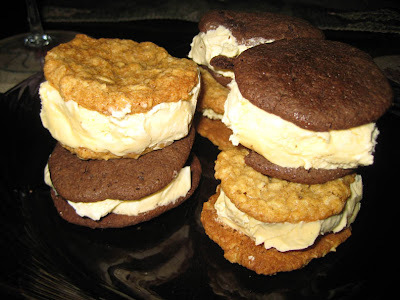 For dessert, I put to use some of the many cookies we had on hand and made ice cream sandwiches. This was accompanied by hot chocolate. Can you believe that I've lived in Baltimore for 44 years and had never experienced Andy Nelson's bbq? Until now, that is. After our marathon cookie-baking session a few days before Christmas, Mr Minx, my brother, and I were trying to think of a place to grab some dinner. Somewhere not in the vicinity of the Towson mall and the insane traffic situation that was bound to exist in the area. I was pushing for sushi, but somehow we simultaneously decided that ribs were the perfect post-baking food. Mr Minx and I retold our tale of disappointment at the Charred Rib, and we briefly contemplated Razorback's (very briefly, as it is across from the mall) and the Corner Stable. We ultimately settled on Andy Nelson's, down the road from the surprisingly-desolate-for-Christmas-Week Valley View Farms. Former Baltimore Colt (that's right, Baltimore Colt) Andy Nelson serves real barbecue, not just cooked meat with sauce on it. The meat is hickory smoked until tender, and sauced or not. and cole slaw, BBQ tater wedges, and cornbread as sides. I'm used to falling-off-the-bone, porky-tasting ribs. I think the ones I make are some of the best, but I understand that for purists, they aren't 'que. 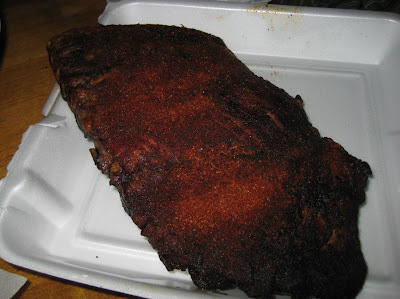 The ribs at Andy Nelson's have more of a "chew" - the meat must be manually (or dentally) separated from the bone. It's still very tender, however, and sports a bright pink shade from the hickory smoke. The flavor was almost a bit like ham. The dry rub was heavy on the paprika and not at all sweet, but I didn't think the meat necessarily benefited from a dribble of sauce. It was fine as is. Next time we'll definitely taste the wet style, for comparison's sake. The pulled pork had a vinegar-based sauce and was nicely tangy. The sweet-ish cornbread was in perfect contrast, but I also enjoyed the non-sweet cole slaw that reminded me of my grandma's. 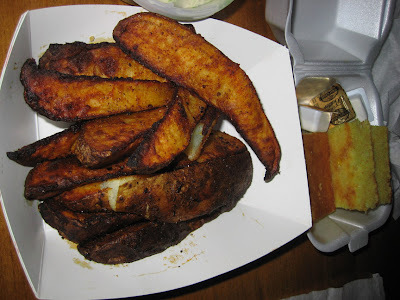 The huge potato slabs were well-seasoned and nicely fluffy on the inside. Next time we try the potato salad. And the collards. And definitely the brisket. And I definitely won't be waiting anywhere near as long for that next visit. ...even if it is just an f'd up translation. 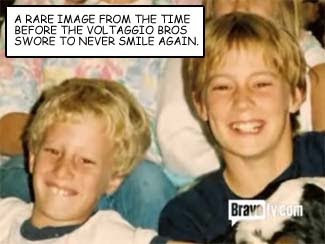 While perusing teh Innernets for Top Chef-related items, I found this fab article on the Voltaggio Brothers. 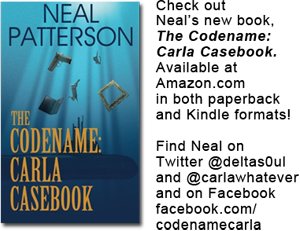 It was originally English, translated into another language, and then translated back into English. The tall propagandize culinary humanities clergyman who taught Bryan Voltaggio how to put together the great bearnaise watched him "deconstruct" the salsa upon inhabitant TV. The courtesy as good as await from everybody in locale has been unbelievable," pronounced Bryan, 33. The Voltaggios grew up in Frederick, sons of the ecclesiastic workman as good as the state guard whose moonlighting in road house confidence got them in to the Holiday Inn kitchen as teens. Not only did I bake peanut butter and chocolate gingerbread cookies, I also went a little crazy and made plain chocolate and regular oatmeal cookies to accompany the usual snickerdoodles and Toll House. And I took the leftover bacon fat shortbread dough from the freezer and baked those up as well. Good thing I had my trusty helpers to assist with baking, otherwise I'd be more crippled than I am. I think we baked at least 30 dozen, if not more. Dad stopped by and took home a bag of assorted goodies (he favors burnt ones), and my brother got about a third of the remainder. We'll be eating cookies until February. Want some? I'm not a big apple eater, as I am slightly allergic to them when raw. I definitely can't eat the skins. But recent trips to the supermarket revealed a whole new world of apples beyond the usual Red and Gold Delicious and Granny Smith varieties. I thought it could be interesting to do an apple tasting and picked up three that neither Mr Minx nor I had tried before. The Ambrosia apple is a cultivar from British Columbia. It has a fairly typical sweet apple aroma. The flesh is crisp and juicy. Low in acid, the flavor is nicely sweet and slightly complex. It is a perfect apple for eating out-of-hand. They are also slow to oxidize, so are good for fruit salads. As I tend to like sweet apples, this was my favorite of the three. The Macoun, a cross between the McIntosh and the Jersey Black, had a pear-like aroma and a mushy texture reminiscent of my mother's favorite Winesap. Like the Winesap, Internet info tends to call both apples "crisp" whereas I think they are anything but. The flavor is gently sweet, aromatic, slightly floral, and what Mr Minx called "candy-like, or vanilla," and very low in acidity. Great for eating out-of-hand, if you appreciate the texture. The Pink Lady apple, a Aussie cultivar, is a cross between a Golden Delicious and a Lady Williams. It has a sweet smell, like a Red Delicious, but a very tangy flavor, almost like a Granny Smith, with some perfume-y aspects. The texture was hard/crisp and juicy; Mr Minx called it "refreshing" and a good apple for summertime eating. I think it would be terrific for pies, and in salads. What are your favorite apples and why? What do you suggest I try next? 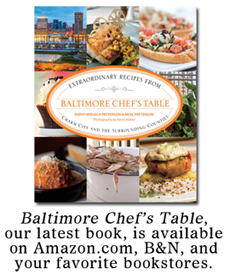 Over 70 restaurants are participating in Baltimore's Winter Restaurant Week this coming January 22 - February 7th. Lunch prices are up a penny to $20.10, but dinner prices are now $35.10 for three courses. Still a great deal! To keep my mind off of the crazy amounts of snow that were falling this past Saturday, I decided to bake some cookies. I usually bake Christmas cookies with my brother, who functions as both helper and Head Cookie Tester, but as he was snug in his own domicile on the other side of town, I thought I could bake a few kinds that might not interest him as much as the usual Toll House and snickerdoodles. He's deathly allergic to peanuts, so it seemed a good time to make peanut butter cookies. I've never ever made peanut butter cookies, so not knowing the ultimate recipe, I went online and chose one at random. 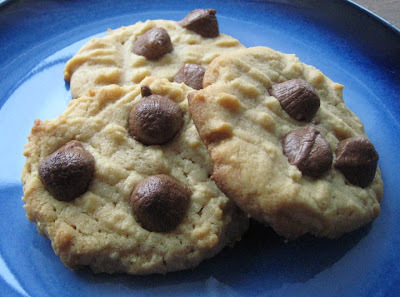 I like the idea of chewy cookies (although I'm seldom successful in achieving the proper chewy texture) so this recipe attracted my attention. The chocolate-y blobs are mini peanut butter cups from Trader Joe's. I like to gild the lily. Next up were chewy chocolate gingerbread cookies, which I discovered at Sweet Mary. 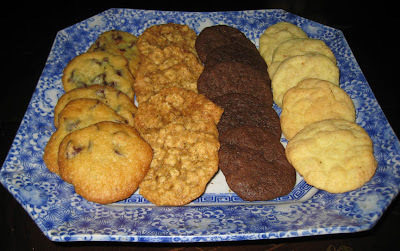 She used Martha Stewart's recipe for these spicy cookies with cocoa powder and chocolate bits. I love gingerbread, and I love chocolate cookies, so these sounded especially delicious. The verdict? The peanut butter cookies are my (and Mr Minx's) favorite of the two. They are crisp on the outside and a bit chewy at the center. 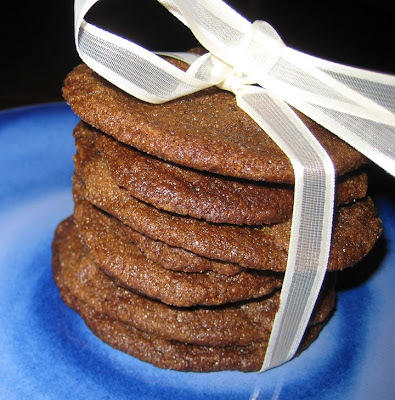 The gingerbread cookies have a similar crisp/chewy texture, but the recipe has a tad too much molasses for my taste. Although I love gingerbread, sometimes this is an issue for me. I think my Dad will love them though. 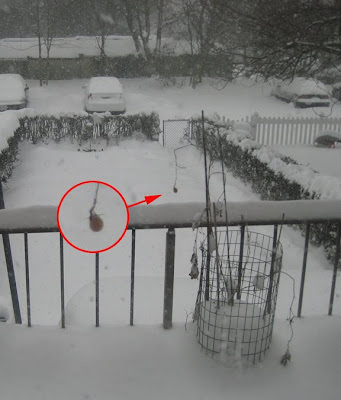 There's about 8" of snow outside, with expectations of much more before morning, and this tenacious little pear tomato is still valiantly hanging in there. I took a tentative bite. When my teeth bounced off the shrimp instead of biting through it, I placed it discreetly back onto my plate and covered it with a lettuce leaf. And so it goes every year at our Group party - our boss brings in a ton of extra large steamed shrimp, plus extra spicy cocktail sauce. Every year the shrimp are still partially frozen, water-logged, rubbery, and tasteless. Every year I try one, just in case it's miraculously edible. It never is. Other than that, our food is usually pretty good. The holiday party is a pot luck affair, with several of us bringing home-made food, and a few people opting to buy goodies from the Lexington Market and beyond. 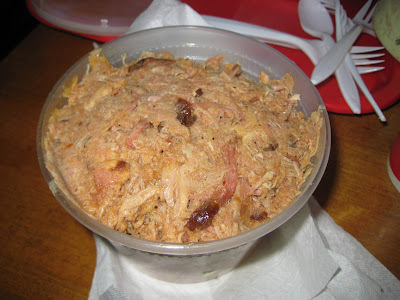 Down one microwave this year, we planned on chow that was good at room temperature or chilled: two guys made different variations of mayo-less potato salad, one lady brought two huge vats of home-made Thai rice and noodle dishes, and I made several pounds of curried chicken salad. I usually prefer the home-cooked food, but this year my favorite dish was the "Bruce Lee" wings purchased at the Cross Street Market. They were perfectly cooked, crispy crunchy despite being a) cold; 2) coated in a vaguely-Asian sauce (think General Tso's, without the heat). There are twenty of us in the group, and we eat like pigs. Even our resident vegan becomes omnivore for a a day. The result is that few items end up as leftovers - usually some green salad, some rotisserie chicken, a bit of 7-layer dip. And of course those dreaded nasty shrimp. Every year, the fridge is full of leftover shrimp. With any luck, the non-Group people who work on our floor will pilfer some. Wonder if we could get the boss to spring for Bruce Lee wings next year instead? I'm always printing out interesting recipes I find on the Internet. I have a stack of paper 2" high that desperately needs a binder to keep it all organized. Maybe I'll have time during my holiday vacation (16 days this year!) to work on it. Or not. 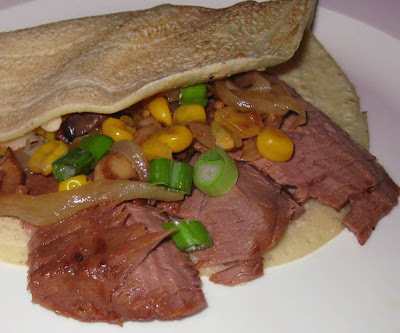 One of those recipes was for soft corn taco shells. Kinda sorta tortillas. But maybe more like pancakes or thick crepes. The first one I poured out ended up more like a gordita, so I used a lot less batter for the rest of the batch. They were kinda interesting - a little rubbery in texture and they needed a bit more corn flavor. But they did the trick. Kinda looks like Audrey from Little Shop of Horrors having lunch, doesn't it? There are several "taco shells" left, and I might try melting some cheddar cheese on them and pretending they are "corn bread." Or not. As I get older, I find myself thinking that some commercial foods just don't taste the same as they used to. My flavor memory is pretty strong, and in my mind's palate, I can still taste a 70s Milky Way bar. I eat one today, and there's no comparison - it's just not the same. Tastykakes? Again, not the same. I blame it on high fructose corn syrup. Were Doritos and Cheetos always so salty? Or is that an effect of my now more-sophisticated sense of taste? I'm happy to occasionally discover that some things have stayed much the same: gherkins, Utz potato chips, Hershey bars (not that they were ever good). But I'm sure eventually they will change. Or I will. What are your favorite snack items/candies that just aren't the same as they used to be? Here we are at last, finally the final finale for Top Chef Las Vegas, a season of sheer professionalism and relative lack of drama. Honestly, I miss the shenanigans of past seasons - they made for more entertaining recaps. 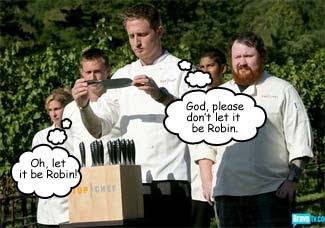 It's been a long, long, long season and our three remaining cheftestants are looking forward to their final battle. Kevin is both "pumped" and "stoked." 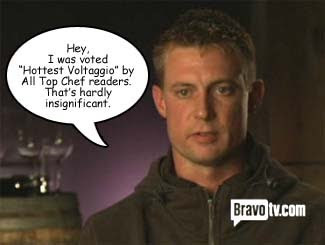 And the Brothers Voltaggio are bickering amongst themselves. At least neither of them says "awesome" or walks around with hugemongous umbrellas. They stop needling each other long enough to put on their chef coats and head out to the Rutherford Hill Winery, where they find Tom and Padma standing in the blazing sun. Tom gives them their final challenge - prepare a three course meal. Sounds simple enough, right? But this is Top Chef, so there's a twist. 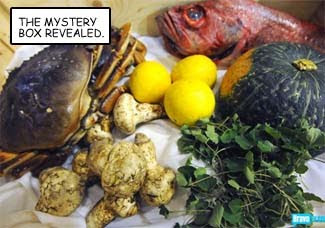 The first course must be prepared from a Chopped-style "Mystery Box." (The Food Network has been ripping off Top Chef in their competitions for a few years now. Turnaround is fair play, I suppose.) For the second course, the cheftestants can prepare anything they wish from any available ingredients. And finally, the third course must be dessert. The meal will be prepared and served at Cyrus, a Michelin 2-Star restaurant in Healdsburg, and served to top restaurateurs. Tom says that this meal can make their careers. Then Padma tells the cheftestants they will have help, and from the surrounding vineyard emerge the first 437 eliminated chefs, from Jen Z to Jen C. Jen C. is carrying the knife block, the sight of which causes Michael to say that there are a couple of names he could pull that would make him slit his own throat. It would have been fun had he picked Robin, but the ensuing bloodbath would probably have been too much of a distraction for Kevin and Bryan. And one of those two is going to win this thing, right? 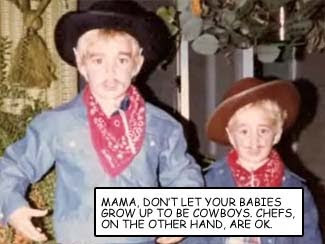 Instead, he gets Jesse and Eli. Kevin ends up with Preeti and Ash, and Bryan gets the best of the bunch with Jen C. and Ashley. One of these sous chefs will help them with prep, the other will help them cook the next day. With 15 minutes to plan, the chefs head to the kitchen to examine their Mystery Box [insert dirty joke here]. It contains Pacific rockfish, kabocha squash, Dungeness crab, Meyer lemon, matsutake mushrooms, and anise hyssop. I love the way my spell check is recommending different words for kobocha (kaboom, kabob), Dungeness (dungeons, dungarees, strangeness), and matsutake (matchmaker, mistake) but seems to think that "hyssop" is just fine. Kevin is upset at getting stuck with "I'm a Lesbian But I Can't Shuck Clams" Preeti. He doesn't have much faith in her abilities so gives her very few things to do, none of which involve pasta salad. 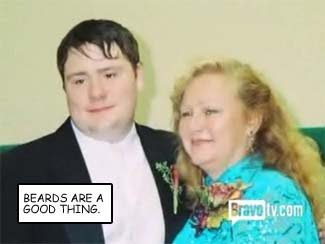 Bryan, on the other hand, is quite pleased with his own personal lesbian helper, Ashley. And Michael is on his knees thanking the heavens that he didn't pull Robin. 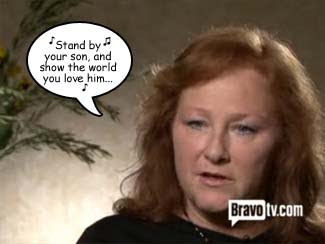 Mom Gillespie reminds me of a faded country singer, with her sparkly eye shadow and blue eye-liner. Mom Gillespie lets her little boy roll his own sleeves, but tells Kevin to be himself and that he's got what it takes to beat the Volt Boys. They then leave their Moms behind and head to Cyrus to finish prepping and cooking. Tom meets them there and finally gives them the expected extra twist. Instead of a three-course meal, they must now prepare a four-course meal, with the first course being an hommage to their mommies. Something inspired by a childhood dish. Kevin decides to make something with chicken skin, since that was his mama's favorite part of the chicken (a woman after my own heart). Bryan says his parents divorced when the kids were very young, and if that wasn't bad enough, their mom made a lot of tuna casserole. And he was going to make it even yuckier by using sardines. Michael said he likes to transform things he doesn't like to eat into things he does like to eat, so he opts to play with the hated broccoli. 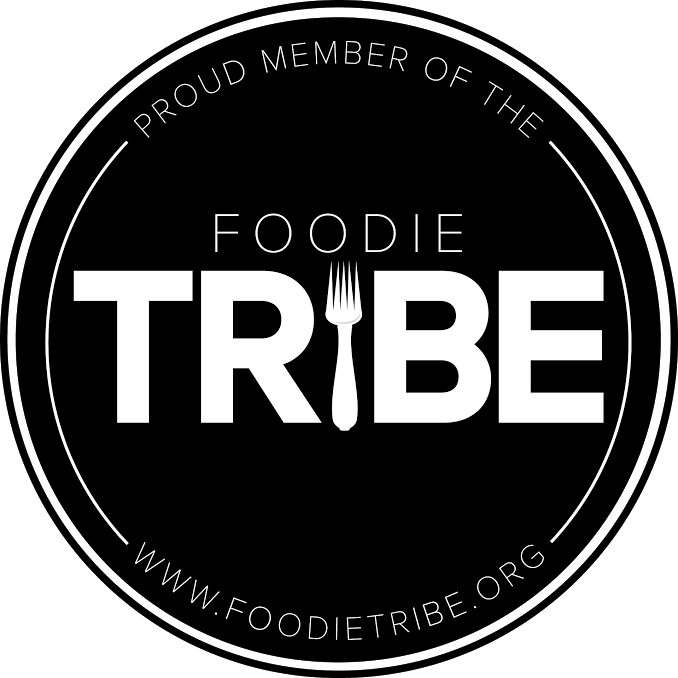 The cheftestants enter the dining room with their first dishes and notice their moms seated at the table along with Tom, Gail, Toby, and Padma, plus restaurateurs Douglas Keane of Cyrus, Donatella Arpaia, Stephen Starr, Drew Nieporent, Sam Nazarian, and wine guy Bill Terlato. Padma then apologizes to the moms, saying that the judges' comments to their baby boys may seem a little harsh. After the first course, the moms are unceremoniously kicked out. Next up is the Mystery Box course. Kevin's dish is merely ok, and features a tough mushroom. 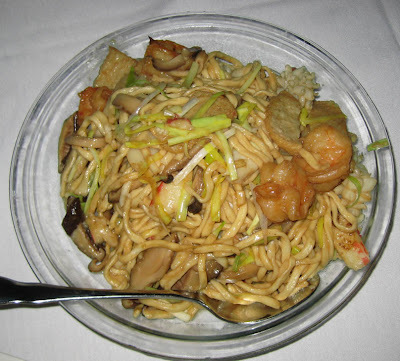 Bryan's dish is bland and safe and is compared to a "blind date you don't want to go on." As if anyone ever looks forward to a blind date. (I had one and it was a nightmare. The guy didn't make eye contact, nor did he speak to me even once. Thank goodness it was a double date with my then-best friend. Believe me, bland fish would have been far preferable.) Michael's dish is the best-received of the three, although nobody mentions scavenger hunts. 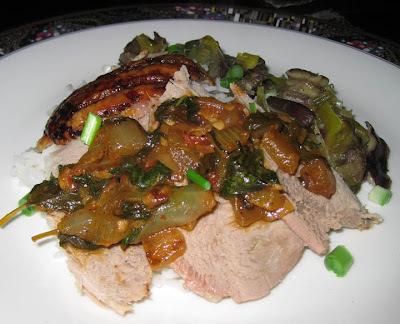 The third course is "Chef's Choice" and of course Kevin chooses to make pork. Unfortunately, it seems that his pork belly didn't get cooked long enough. And at this point I'm realizing he's not going to win this competition. That means Bryan is going to be victorious, right? Bryan, who reveals to all assembled that he hunts, is told that his venison dish is perfectly cooked, "rich and pungent," and not at all bland. That gives me hope. 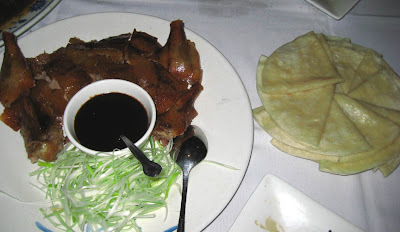 Michael's squab is excellent, but Gail thought the sundry mushroom and pistachio garnishes were gimmicky. Ok! 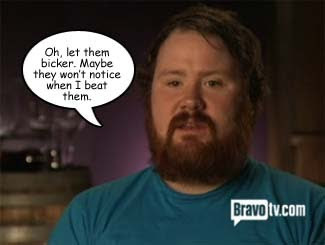 Go Bryan! Finally - the dreaded mandatory dessert course. Kevin had worried earlier on that dessert was not his strong suit, so he opted to use an ingredient that was more in his wheelhouse - bacon. Bacon desserts are starting to be a bit played out, I'm afraid, and there were mixed emotions about Kevin's bacon and bananas among the judges. Michael's cake was overbaked and dry, but overall it was "almost very good." Bryan's cheesecake with fig sorbet, on the other hand, showed real finesse. Yay! 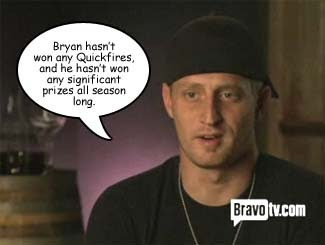 Bryan is going to take this competition! Right? Right? Despite my wishful thinking, at this point I'm positive Kevin has lost. I'm (obviously) rooting for Bryan, but a small sinking feeling in the pit of my stomach tells me that Michael is going to end up winning this thing. Next we see the cheftestants once again stewing in the Please Buy Chimney Rock Wines Stew and Sip room, this time without the wine to take the edge off. I need a glass myself, at this point. Bryan, Michael, and Kevin all head off to Judges' Table by themselves, like big boys, without Padma having to come in to get them or their mommies to re-roll their sleeves. The judges tell the cheftestants about their successes and mistakes. 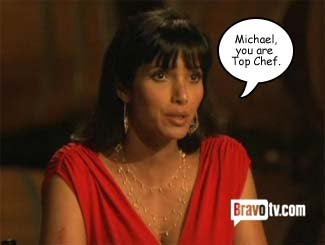 And then Padma asks the always-stupid question "why do you deserve to be Top Chef?" Bryan seems a bit flustered, but tells the judges that he thought he expressed his cuisine well throughout the competition. 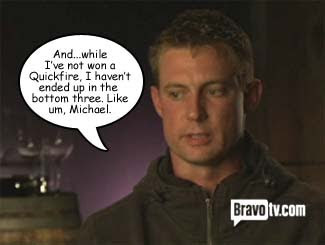 Michael wants to win because he doesn't want Bryan to win. Then he adds, "Food is me. Food is how I express myself." Damn good thing he has food, because grammar isn't his strong suit. And we hear from Kevin that he loves food (no!) and its ability to comfort people. Back at the stew room, all three seemed slightly depressed. 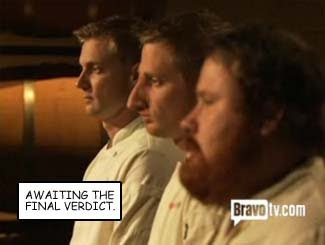 The judges make their decision and call the cheftestants out to stand before them one last time. Padma fakes us out by saying, "Kevin..." (long pause) "...you are not Top Chef." At which point he hugs everyone and goes back to the stew room to be comforted by his mom. Bah. Oh, he deserves to win alright, unlike Hosea. 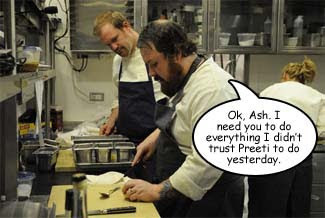 He's a talented chef, but he was my fourth choice to be Top Chef, after Bryan, Kevin, and Jen C. Sigh. 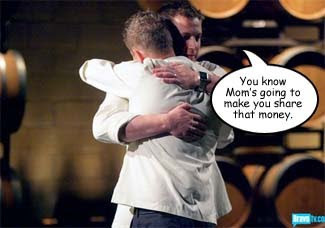 Next week: A Top Chef Reunion where we, no doubt, will hear how much certain people hated Robin. Yawn.